Sam Jenkins’ law enforcement colleagues know he’s quick to ask a professional favor. But when a beautiful Treasury agent asks for his assistance, he balks. Special Agent Lucy Frobisher wants Sam to re-open a forty-three year old investigation and find her father’s killers. Reluctantly, the ex-New York detective turned Tennessee police chief delves into the robbery-homicide and finds himself back in the 1960’s, chasing down a group of anti-government anarchists who robbed banks to finance their violent revolution. Join Sam and his friends from Prospect as he tracks down a former school mate who found herself a spot on the FBI’s 10 Most Wanted List. Things happened in 1968. Assassins killed Bobby Kennedy and Martin Luther King. I was a young soldier waiting for my twelve-month vacation to the Republic of South Vietnam. And Prospect, Tennessee, a small town in the foothills of the Smokies, gained prominence. 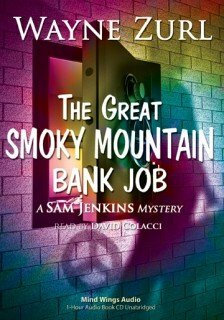 Thanks to the national media, an armed robbery which took place in Prospect became known as The Great Smoky Mountain Bank Job. Lucy took a seat and looked at me with expressive light brown eyes. Her two-piece navy blue suit appeared expensive. The skirt landed only an inch above her knees, which she held together very properly. “My father was murdered,” she said. “I’d like you to help me find the killers.” That’s not the kind of request you hear everyday in a small Tennessee police department. I’d ask how Ralph Oliveri, my pal from the FBI’s Knoxville field office, got involved, but I started with a few more basic questions. After that I was surprised. I did some quick math and came up with a figure. I would have placed Lucy Frobisher in her late-thirties, but with her father getting killed forty-three years ago, she had to be at least forty-two. I noticed her looking around the room—at the flintlock Tennessee rifle hanging on the wall behind my desk, at the shadow box with the medals and badges from my time in the Army, and at the counter where the mini-refrigerator, coffee maker, and a vase of artificial flowers sat. I fixed two cups and watched her take a stack of newspaper clippings and official reports from her briefcase. I sat behind my desk, took a sip of an extremely hot Indonesian blend, and listened to Lucy tell me her father, Douglas “Buck” Frobisher, not only worked as a bank guard, but also served as a Blount County deputy sheriff, the security job being only a part-time gig. According to Ms. Frobisher, the robbery went off like something from a 1970s “heist” movie. Three males and one female entered the bank just before closing time carrying shotguns and pistols. All wore rubber Halloween masks. After an attention-getting shot went off and Buck Frobisher stepped out of the men’s room, he drew his revolver and foolishly told the four armed felons to drop their guns. One of the males fired his shotgun and Frobisher bought the farm. The anarchists made off with $46,000 dollars before a bank employee could trip a silent alarm connected to the police station. Two days later, in a message sent to the Knoxville News-Sentinel, members of the RYM claimed responsibility for the robbery. The former Prospect police chief, one Eli “Peanut” Crowder, called in FBI assistance. Lucy said the investigation lasted for months, but as with many crimes perpetrated by a crop of home-grown anarchists from the late ‘60s, it remained unsolved.